Even though that Mission statement was adopted in 1996, about 10 years after the founding of the Chorus, those principles have guided the group since its inception in 1986. It was then that a small group of gay men had a dream of forming a choral group in Kansas City. After much discussion and planning, their efforts led to the formation of the Chorus, which had its debut concert with 30 singers on December 14, 1986 in Pierson Auditorium on the campus of the University of Missouri-Kansas City. HMC quickly became a safe harbor for a community seeking solace and relief from prejudice and the devastating AIDS crisis. Public acrimony was so strong the word “Gay” was not part of the Chorus name for fear of members being fired from their jobs or shunned by family and friends. So our history, born from the scars of discrimination, is very important to HMC’s members, audience, and patrons. In fact, the first concert was performed in memory of Chorus member Brian McGlothlin, the first of more than 60 members of our Chorus family who have died over the years. They form our “Ad Astra” section, including Frank Woltkamp, a founding member of the Chorus, who sang every concert from 1986 until his death in 2008, an honorable streak of 65 concerts. The Chorus community continues to evolve as we reach out to diverse audiences, changing hearts and changing lives. Over the years, the Chorus has performed in a host of area venues including churches, theaters, nightclubs, parks, and union halls. HMC found its permanent performance venue in 1994 at the historic downtown Folly Theater. Outreach performances are a critical part of HMC’s mission of reaching new and diverse audiences. We have sung for opening galas like the traveling exhibit of the Smithsonian Institution and the national signature event of the Lewis & Clark Bicentennial, A Journey Fourth. We’ve changed hearts and minds through many events including Martin Luther King Day observances, Harmony in a World of Difference, and AIDS awareness. The Chorus joined with the Women’s Chorus of Dallas to present Sing for the Cure, a benefit for the Susan G. Komen Breast Cancer Foundation. HMC is a member of the Gay and Lesbian Association of Choruses (GALA), the national service organization for LGBT choral groups. The Chorus has collaborated with the GALA choruses of St. Louis, Chicago, Washington, D.C., Dallas, Portland, and the Twin Cities; and has performed at seven quadrennial festivals of GALA Choruses Inc., including, Tampa, San Jose, Montreal, Miami and three times in Denver. Members have shared the stage with international GALA choruses in London, Paris and Hamburg, Germany. And in recent years, the Chorus has presented pieces based on works by internationally renowned children’s author Tomie De Paola and performed on the Folly Theater Children’s Series, presenting music to two sold-out houses of schoolchildren. In addition, the Chorus has produced DVDs of two extraordinary concert events: The Few, the Proud, featuring Col. Margarethe Cammermeyer as narrator, and All God’s Children, featuring the Rev. Dr. Mel White of Soulforce as narrator. 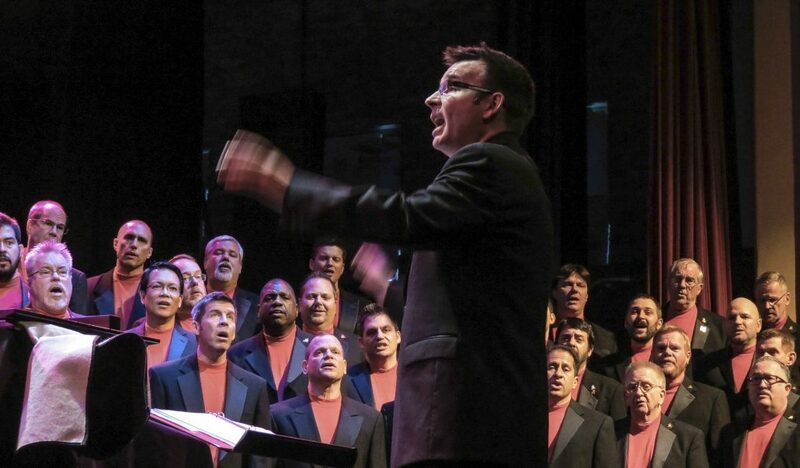 Dedicated to choral excellence, Heartland Men’s Chorus has been led by talented and enthusiastic directors through its history. The first volunteer conductor of the Chorus was Father Ambrose Karels, followed by co-directors Rande Stewart and Stephen Johnson. 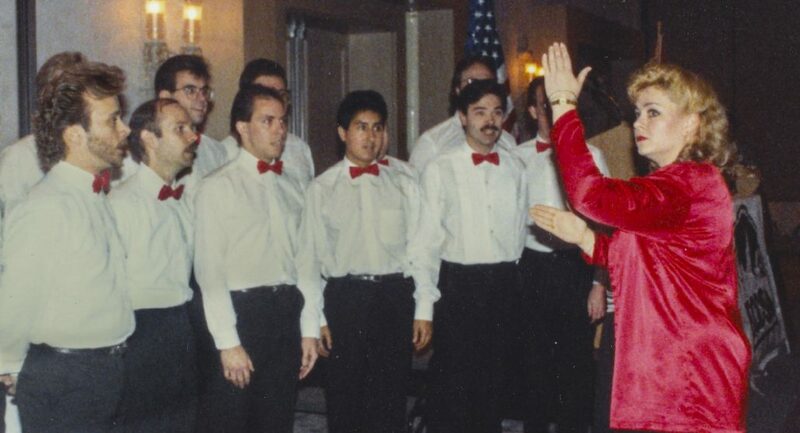 In 1987, the late Gina Scaggs Epifano became the first paid director of Heartland Men’s Chorus. Among GALA directors, she was one of the first women to conduct a men’s chorus. She was followed by Reuben Reynolds III, who directed the Chorus from 1990 to 1998. In his tenure, the Chorus reached new heights, moving to the Folly Theater as a venue, and broadening its scope and reach. 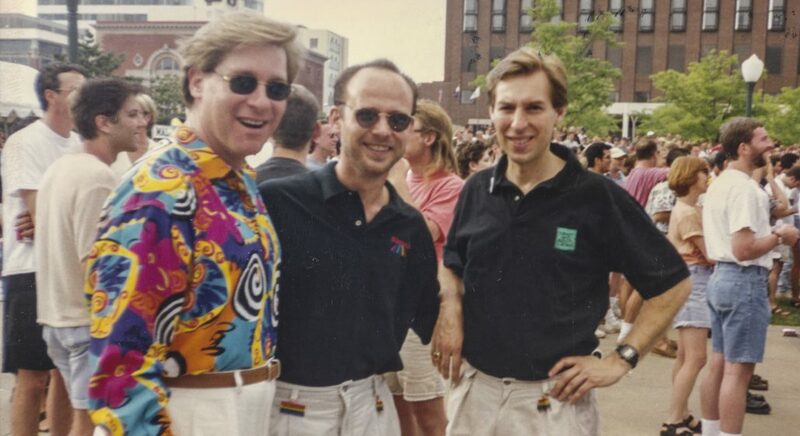 It was under his leadership when the Chorus received the GLAAD (Gay and Lesbian Alliance Against Defamation) Award in 1997 for its outstanding achievements as an arts organization and for its highly visible presence in the Kansas City gay and lesbian community. Reynolds left HMC to become artistic director of the Boston Gay Men’s Chorus. In 2009, Nadeau brought HMC to perform at the 50th anniversary convention of the American Choral Director’s Association in Oklahoma City. HMC was only the second gay chorus to be invited to perform at this prestigious organization’s annual convention. Nadeau left HMC to become artistic director of the Gay Men’s Chorus of Los Angeles. Current Artistic Director Dustin S. Cates assumed the role beginning with the 2014-15 season, continuing the tradition of artistic growth. Thanks to Cates’ leadership, the Chorus’ reputation for excellence has reached beyond the GALA network of choruses. In 2015, the Chorus performed at the convention of the Kansas Choral Directors Association in Topeka, and in 2017 was the first-ever community chorus invited to sing at the convention of the Missouri Choral Directors Association. HMC also sang at the Southwest Regional convention of the American Choral Directors Association in 2016. Under Cates’ direction in 2015, HMC produced its sixth musical documentary, Modern Families, which emphasized the importance of all families, regardless of how they may be defined. Rick Fisher became Executive Director in 1997, and is the longest-serving GALA Chorus executive director. 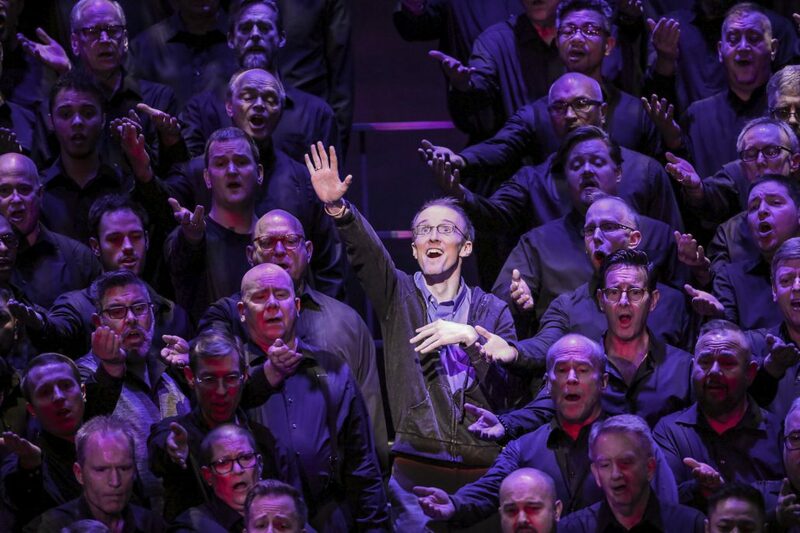 Responsible for day-to-day operations, Fisher is assisted by HeartLight, a group of non-singing HMC members who provide essential behind-the-scenes work and valuable support for the Chorus. HMC’s 18-member Board of Directors and its seven committees (Fund Development, Finance, Human Resources, Board Development, Marketing, Membership Services, and GALA Fundraising) make decisions for the long-range growth of the Chorus. The Board consists of both chorus members and community members, all of whom have a sincere passion for the financial and artistic success of the Chorus. Among the goals of the Chorus is to advance men’s choral music through the commissioning of new compositions and arrangements. Heartland Men’s Chorus has commissioned several major works: Two Flutes Playing, by Kansas City composer Mark Hayes; Country Angel Christmas, based on a children’s book by Tomie De Paola; Life is a Cabaret, a joint-commission with the Gay Men’s Chorus of Los Angeles to pay tribute to the songwriting team of John Kander and Fred Ebb; Oliver Button is a Sissy, a joint GALA Chorus commission based upon another book by De Paola; and I Am Harvey Milk, an oratorio by Broadway composer Andrew Lippa, celebrating the life and legacy of the civil rights hero, jointly commissioned by six GALA choruses. The Chorus also has commissioned several song arrangements, featuring the talents of Eric Lane Barnes, Mark Hayes, Scott Farthing, and Paul Siskind. In 2017, HMC undertook its largest commissioned work, We, the Unknown, composed by Timothy C. Takach. In collaboration with the World War I Museum and Memorial, the piece will be performed in June, 2018. Their 30th Anniversary in 2016 inspired the Chorus to expand its efforts to be heard across the region. The Chorus mounted a bus tour of cities in Kansas, bringing our voices to Topeka (across the street from the Westboro Baptist Church), Abilene (at the Eisenhower Presidential Library), Salina, Russell, and Hays. Closer to home, the Chorus has performed at venues in Johnson County, Kansas including the campus of Johnson County Community College, and a first-ever fall concert at the United Methodist Church of the Resurrection in Leawood. 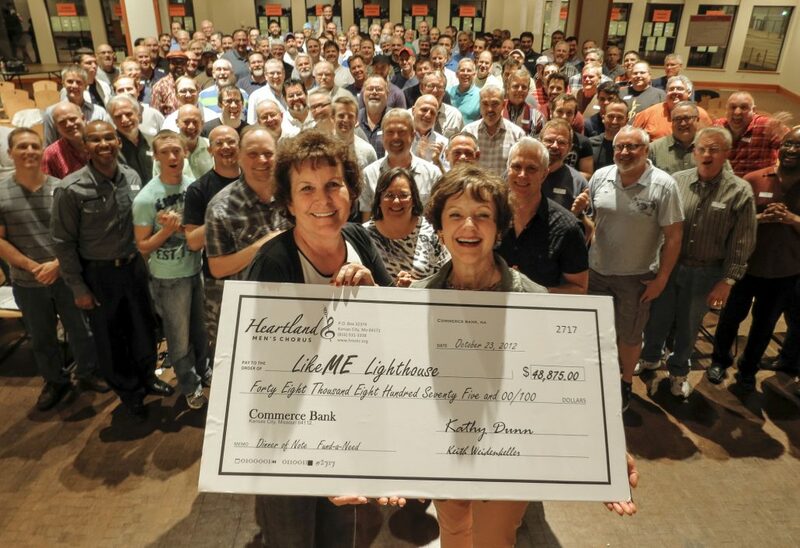 HMC has expanded its social impact with the creation of the Heartland Men’s Chorus Scholarship for an LGBT choral student at the Conservatory of Music and Dance at the University of Missouri-Kansas City, funded by Chorus members and donors. In 2017, the Chorus presented the Midwest premiere of “Tyler’s Suite,” a choral work dedicated to the memory of Tyler Clementi who committed suicide after he was cyberbullied for being gay. Performed in both Kansas City and Minneapolis, it has inspired HMC to develop Out in Our Schools, an anti-bullying program starting in 2018. In 2018, HMC premiered the major work We, the Unknown composed by Timothy Takach. This piece, part of WWI centennial observances, was created in collaboration with the National World War I Museum and Memorial in Kansas City. It recounted the selection of the unknown soldier for the Tomb of the Unknowns in Arlington Cemetery, imagining who that soldier might be — an African American, a gay soldier, one who was dutiful but fearful, or a beloved son. For several months, KMBC9 journalist Matt Flener followed the chorus around chronicling the creation and world premiere of We, the Unknown. This one-hour documentary special recently aired and can be viewed on the Web here. To learn more about the history and background of the creation of this work, visit the project Website. Looking back on the years since 1986, it is amazing how far Heartland Men’s Chorus has come. Looking ahead, there is no limit to what the Chorus can do as we live our Vision: Our Voices Enlighten, Inspire, Heal and Empower.